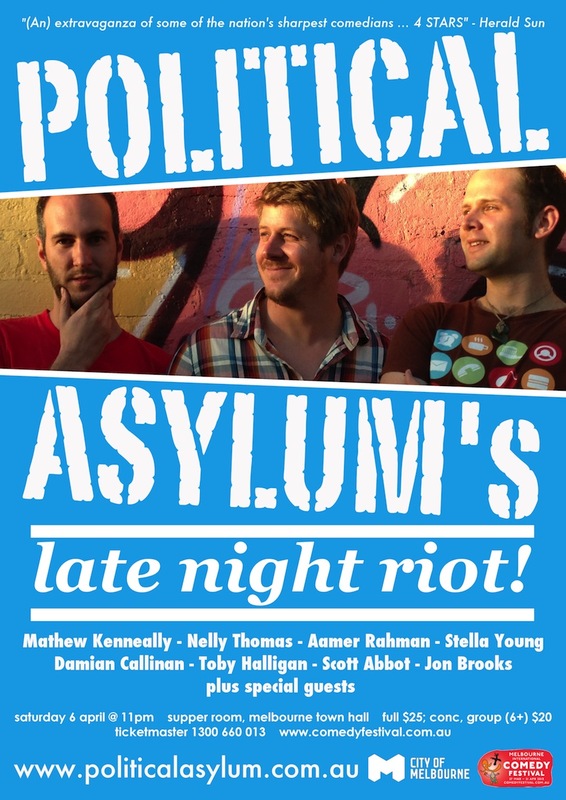 Political Asylum has been a regular part of the Melbourne Comedy scene since 2009 with a monthly show and elections specials, it has also always been part of Melbourne Fringe Festival. 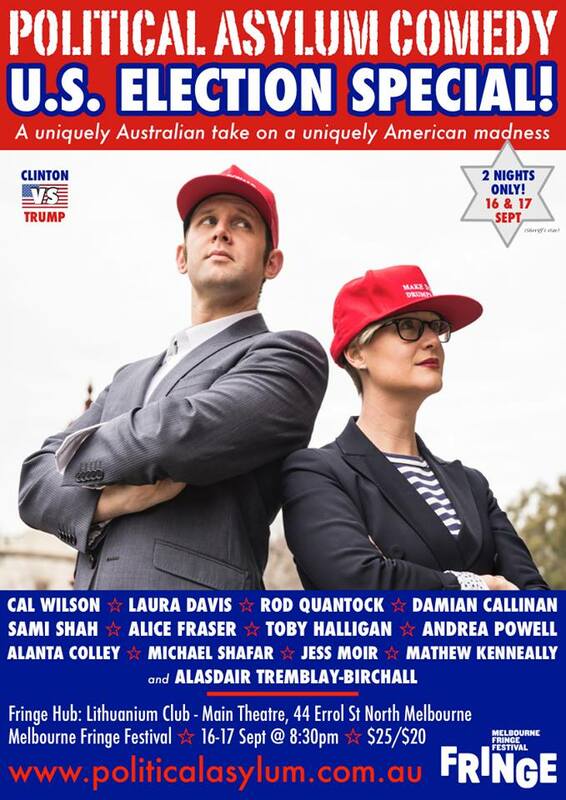 This year at Fringe they could not help but do a special about American Politics and the extraordinary shenanigans leading up to this year’s American Presidential Election. This is probably influenced by the fact that two of the main producers of Political Asylum have been living in the U.S. for the past couple of years. The atmosphere in the main room at The Lithuanian Club was set beautifully with the American flag flying on screen, red white and blue balloons and streamers (Go Doggies! Oops the AFL finals are on, sorry) and American political music playing, Bruce Springsteen, Bob Dylan etc. Host Toby Halligan was energetic and firing on point with great snark and sharp observations and carried the ninety minute showcase well. First up Laura Davis who just keeps getting better every time I see her, slaying the crowd with her material about gun control and then her magnificent feminist gear which though slightly off point was so stunning she had the audience gobsmacked and delighted. 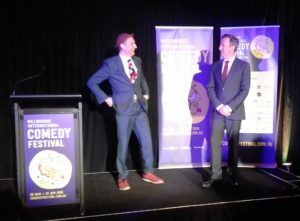 This was followed by Michael Shaffer who really impressed with his relaxed on stage persona and smart up to the minute jokes about things that have just happened in American politics. I look forward to seeing more of Michael in the future. Impressive up and coming Alanta Colley changed the pace of straight standup to present us with a hilarious political quiz a bit like Who Am I from Sale of The Century but without the home viewer. It was a fantastic way to expose the politician’s appalling and ridiculously inappropriate CV. Am looking forward to seeing Alanta’s own show later in the festival. Alasdair Tremblay-Birchall changed the pace again, for his delightfully daggy, “Meanwhile in Canada”. A Canadian expat, Alasdair celebrated Prime Minister Trudeau and focused on the contrast of the sanity of Canadian politics verses its disturbing next door neighbour. He used the big screen for his accompanying pictures well. It was time to welcome back Matt Kenneally from his two years studying in America. He had a lot to joke about with his only glitch being his ignorance about the rise of gun violence in Melbourne over the past year. Not to the extent of the US but worrying none the less. He’ll soon pick things up and anyway, this was about America and there he knew what he was talking about. He knows people who are voting Trump and why. He shared the terrifying heart of the election. It’s great to see Matt on stage again doing comedy about politics where he has always shone. 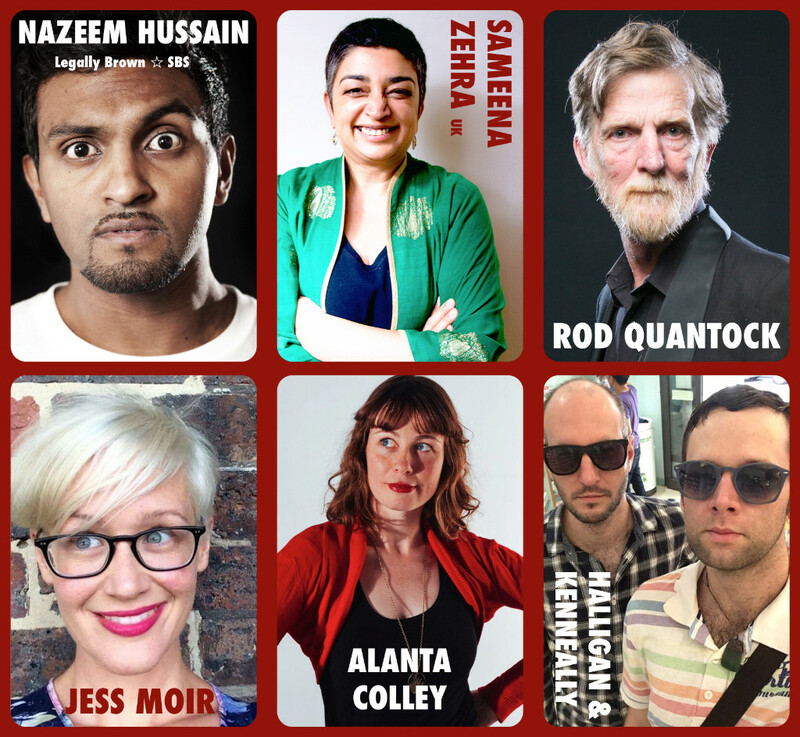 It’s also fantastic to see Jess Moir on stage bringing her bubbly personality to political comedy again. Not sure why I’ve not see her for a while but she’s an intelligent endearing comedian and I hope she does more in the future. 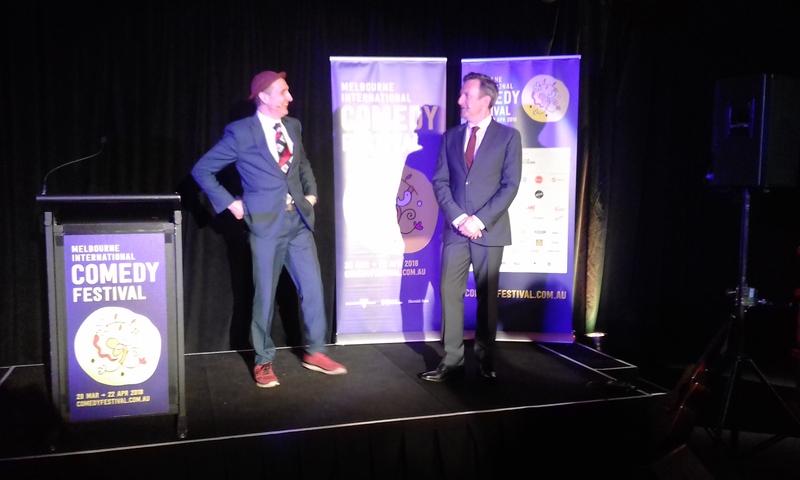 Then the traditional finale with the not quite so bubbly but still amazingly energetic Grandfather of Australian political comedy Rod Quantock. 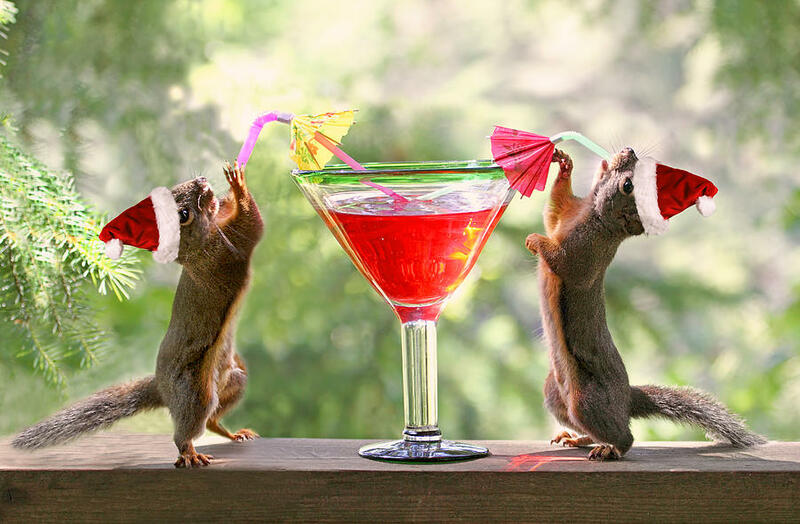 Still able to surprise and have fun while making caustic observances and inciting revolt. He’s a legend. I loved that the comedians stayed on topic and were making astute jokes about recent incidents rather than hashing up old tropes. I particularly appreciated the lack of lazy ‘jokes’ about Donald Trumps hair. These were good political humourists, they went for the policies and the quotes. This was the first of two Political Asylum’s at Fringe this year. The main team (Toby Halligan, Mathew Kenneally, Jess Moir, Alanta Colley and Alasdair Tremblay-Birchall) are a solid group worth getting out for and the guests which will be different for the next performances will be just as good as tonight’s I’m sure. 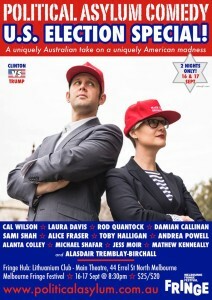 What better way of spending a night at Fringe than laughing at America.